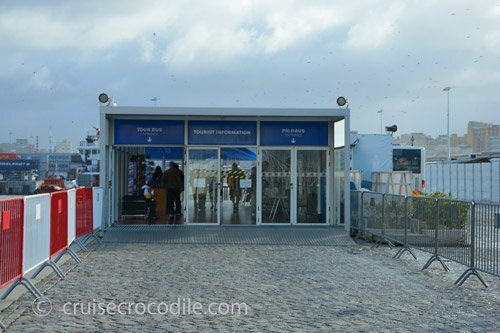 Our Leixões cruise port guide gives you information about the docking location, cruise dock, transportation options and much more! 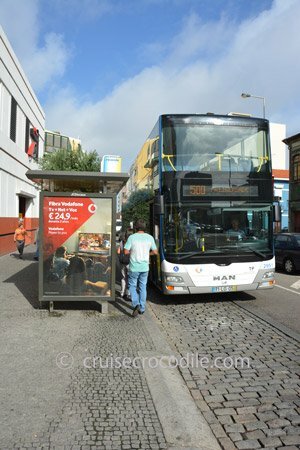 Welcome to the Leixoes Cruise Port Guide. Leixões is the name of the port closest to the city of Porto. The port is about 9 km / 5,5 miles from the city centre. Porto has approximately 240.000 inhabitants and it is one of the oldest cities in Europe. Many, including ourselves, truly think Porto is the most beautiful, charming city of Portugal. This is the town where you can expect anything typically Portuguese; countless houses decorated with Portuguese tiles, Gothic cathedrals, fado restaurants and amazing food. The city is so incredibly colorful and there are so many things happening on every street corner. Just a walk through the city or along the famous Duoro river will give you a taste of this beautiful Portuguese city has to offer. The Portuguese culture in all its glory will never fail to impress in Porto and therefore this entire city centre is also listed on the UNESCO world heritage list. Make sure this one is on your itinerary on a cruise to Portugal. Go for a city walk, explore the countless churches decorated with gold and tiles or enjoy the Port wines made here in the area. There is something to do here for everyone. Find out below how to get yourself from the cruise port to the city centre in our Porto cruise port guide. Leixoes terminal building with shops and tourist information. The port shuttle to the exit of the port. Drop off location shuttle bus at exit of the port. Black/green taxis are the official taxis of Porto. Hop on hop off bus is sometimes waiting for you at the exit of the port. Take the tram to the city centre of Porto. 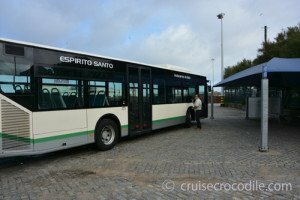 Take the bus to the city centre of Porto. There are two docking spots in Leixões. One spot is in at the cruise terminal (terminal de Cruzeiros) and there is another dock (Doca 1 Norte – Passageiros) . This last one will be in use when there are two cruise ships in port. You can check the following link to see where your cruise ship will dock: http://www.apdl.pt/site-apdl/planeamento/naviosprevchegada.jsp?lang=en. See map above for their locations. Your ship will most likely dock at the Leixões cruise terminal. There is a new cruise terminal that recently openend. There are many facilities at the cruise terminal like tourist information, souvenir shops and wi-fi. There is no walking allowed in the port area. Once you step outside the building you see you either have your shore excursion bus waiting there or you have the take the complimentary, wheelchair accessible bus to the exit of the port. This is only a 1 minute bus ride. The picture on the side shows you the shuttle bus and the drop-off location of the bus. To get back to the ship you will be picked up at the same spot where the bus left you. 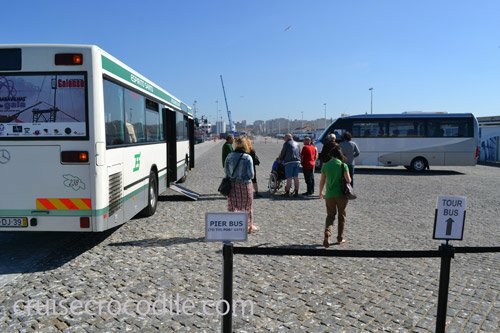 Once you have reached the exit the port you need to decide: stay in Matosinhos (the name of the city where you are as soon as you exit the port) or go to Porto. If you want to stay in Matosinhos than please know the sights here are very limited. You can visit the market, the shops in the area and the beach. The Hop on hop off bus is usually waiting for you at the exit of the port, although it is not an official stop. Search for those double-decker buses at the exit. Especially for those of you who are not good with walking on hilly cobble stoned streets or don’t want to spend to much money the hop on hop off bus is a nice option. Taxis are also waiting for you at the exit of the port. 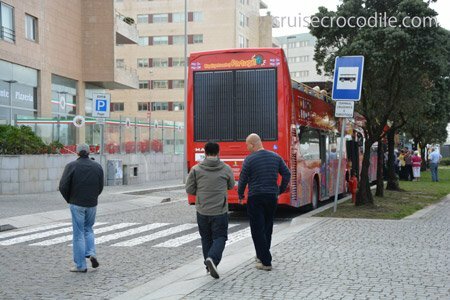 Expect that it costs about 15 to 20 euro one way to Porto city centre. Make sure you check the price before you step into the taxi. 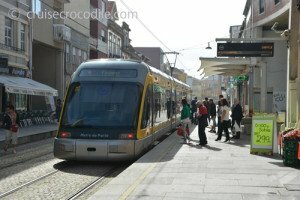 You can also take the metro from Leixoes to Porto city centre. When you get off the shuttle bus, walk straight out of the port and walk 4 blocks until you see the tracks going over the road and spot the nearest stop on your left hand side. See picture on the side to know what it looks like. Buy your ticket on the metro and get off at stop Bolhao for the city centre. The metro is wheelchair accessible. Your other option is to take the bus. You will find the bus stop if you walk from the exit of the port straight into town and see the bus stop 3 blocks into the street on your right hand side. The stop looks like the picture on the side. Bus line 500 goes to the city centre. It runs 3 to 4 times per hour. Pay for a ticket on the bus. The bus is wheelchair accessible. Now that you have your options it is wise to decide before hand on how you would like to go the city. Our personal advice is to take the bus into town. It is fast, easy, cheap and a great way just to experience that little bit extra of Porto, local style. However, the taxi would also be a great option. You are docked in Leixoes, which is about 9 km from the city centre of Porto. – Where is the wi-fi? There is a fast internet connection available in the new cruise terminal. – What is the best way to get to the city centre. Explore your options above. We as port lecturers feel that the bus or taxi is the best way to go. – What is there to do around the port? There is little to do around the port. There is a small market, some shops and a beach. Going to Porto will get you the most out of your day. This 18th century tower is a well known tower in the city of Porto and a great navigational marker as is it visible from many parts of town. This bookstore was built in 1906 and has world wide fame because it is in the top 5 of most beautiful bookstores in the world. There are no pictures allowed inside so the interior will have to remain a surprise for you. There are Portuguese and International book titles for sale in the store. While the exterior of the building is already impressive it is the interior that will blow you away. The station shows you 20.000 splendid azul glazed ceramic tiles that depict the history of the city. A piece of art that took 11 years to make. You’ll find it right in the main hall of the station. This is also where bus line 500 comes in. Why not do like these people do. Sit down on the Av. Diogo Leite and just see life goes by while enjoying the great skyline of Porto. Walk on the boulevard along the Duoro river. On the other side you’ll see Porto and it just is that picture perfect walk. 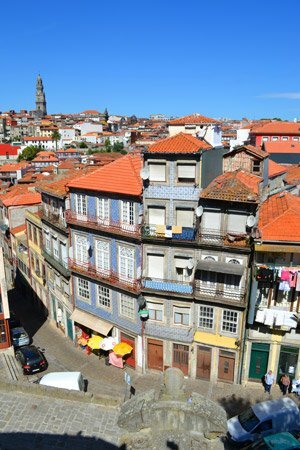 Walk this street along the river side to get a feel for Porto. It’s simply impossible not to fall in love with Porto when you are on a location like this. Casa da Música houses the cultural institution Fundação Casa da Música. The building is known for its non traditional shape. Designer Rem Koolhaas faced the challenge to design a building that would literally think “outside the box”. This building is a must visit for those interested in architecture. This historical building in the centre of Porto is known if its beautiful interior. Make sure to visit the Moorish room inside. The church of São Lourenço is built in Baroque-Jesuit Mannerist style. The interior is decorated with gold and a baroque altar. Does it get any more Portuguese than this? It probably doesn’t. The alluring district of Ribeira is a network of medieval streets that take you back in time. Enjoy the laundry hanging on the balcony’s, the cobble stoned streets and the terra cotta rooftops. When in Porto…. You have to taste the Port wine. This fortified wine is made in the Duoro valley exclusively since the British found out to add liquor to the wine to make sure the wine wouldn’t be spoilt after the long journey from Portugal to Britain. Make sure to stop by one of the tasting locations. If you take a taxi into town this is the spot to ask for. This is the best location to start when exploring Porto’s city centre. It is high up, so it provides beautiful views over Ribeira, the city centre and it will provide that great first impression of Porto. You can visit the cathedral itself, which was built in the 12th century. After your visit to the cathedral make sure to start exploring the network of little market squares and alleyways. Serralves in Porto is known for its mansion, museum and gardens. Contemporary art from the 60’s until present day are showcased at this beautifull museum. This former 17th century Carmelite church together with its 18th century Carmo church is iconic for Porto. In between you find the world’s narrowest house that is about 1 meter wide.